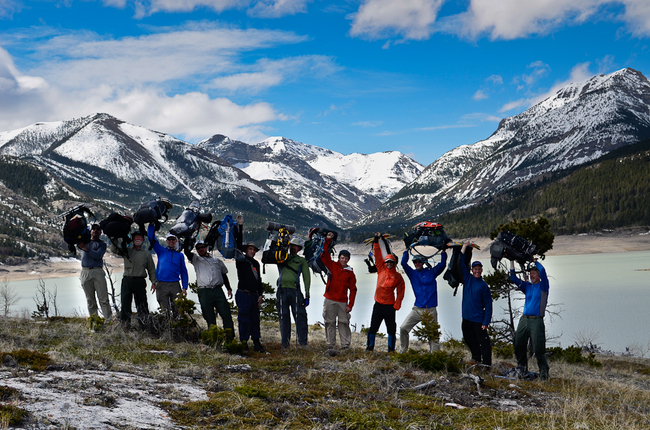 Last week I spent four days in the Bob Marshall Wilderness with Scout Leaders from around the country training them in the art and practice of ultralight backpacking techniques for the Backpacking Light / Montana BSA course. Our goal is simpler, yet more profound, than just playing with gear: thinking about the best ways to impart the knowledge to Scouts in a way that helps them grow, and be encouraged about traveling through Wild Places. We split the twelve of us into two crews of six. We traveled separately along our own off-trail routes throughout the week, and then camped together two out of our three nights, so we could share war stories. I like traveling as a group, and sharing gear, and relying on each other. 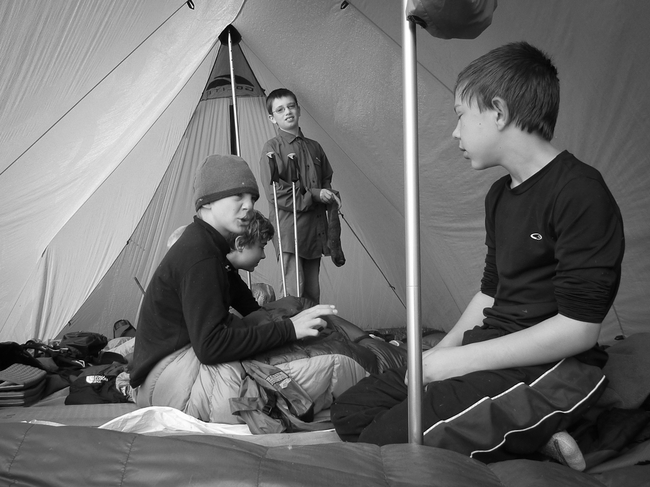 Camp routine as a group is a rewarding way to achieve comradeship. Two people gather firewood, start the fire, and prepare the meal. Two people set up the shelters. Two people hang the bear bag and treat everyone’s water. 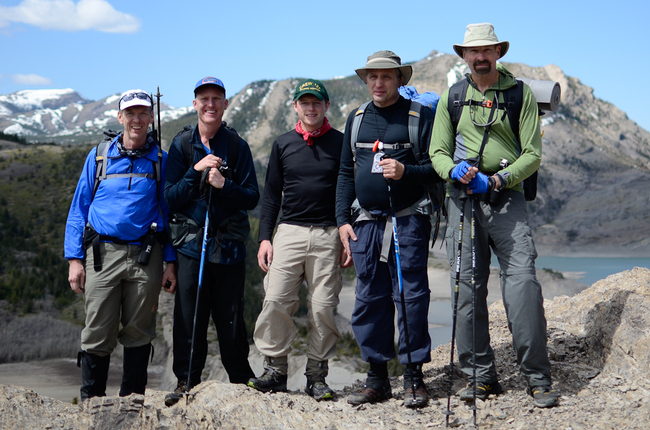 My crew in May 2011 in the Bob Marshall Wilderness, an enjoyable lot of fine company from diverse backgrounds, united with common interests in Scouting and lightweight wilderness travel. When it’s all done, we’ve accomplished something together quickly and efficiently, and strengthened our connections to each other. Connections that you can’t get when you have six people traveling solo with all of their own gear. This connection culminates at dinner time. We say grace, we eat together, we clean up together, we enjoy a fire together, and we chat about the glorious day behind us. This all happens better when we share stuff. This post is thus about Group Gear. 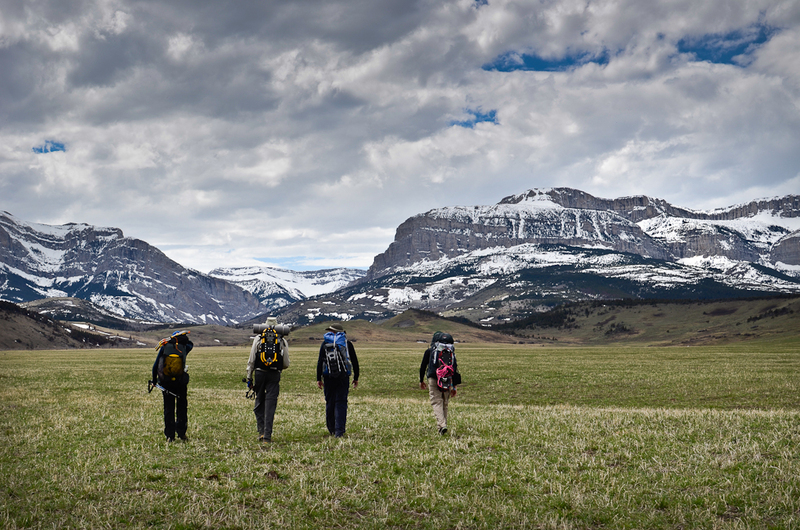 Travel with groups of like-minded individuals. Consequently, you may come from a different framework than I, and may need to adjust your approach accordingly. Pre-trip collaborating: planning an expedition route across the Beartooth Plateau on a wall map tacked to the outside of a remote USFS Forest Service Cabin. Here’s a comprehensive group gear list for a typical three-season trip with a group of six persons. Weights aren’t indicative of resolution achievable by using scales accurate to a tenth of an ounce, because even though tenths of ounces matter to gram counting solo hikers, nobody really cares about them in a group. This list was pretty close to what our crews took into the Bob, except where noted. The GoLite Shangri-La provides an environment of bustling activity for kids and adults alike. Here, Boy Scouts enjoy the business of morning preparation for the day ahead while chatting, laughing, and dreaming together. When possible, putting the entire group into a single shelter creates a great sense of connection. Four-man groups can be accommodated under a large (10′ x 14′) silnylon tarp or large pyramid (10′ x 10′). I like putting larger groups under one of the double-pyramid GoLite Shangri-La’s, and I generally prefer pyramid shelters to tarp shelters in the winter (better protection from cold wind and blowing spindrift, along with steeper walls for snow-shedding), and smaller (more wind-resistant) shelters in high mountain environments. 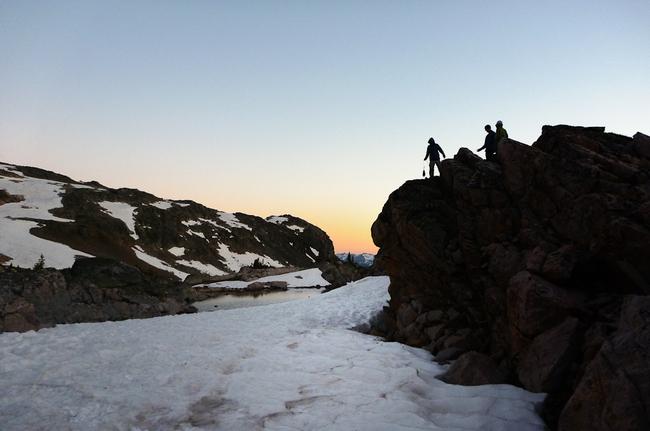 Carbon poles are not recommended for winter, or with less experienced hikers, because they require extra care, and break under heavy snow loading. Aluminum ones are available for about 30% to 40% more weight, and much more strength. I like using long stakes for the four corners and at least two guylines for large shelters. Small stakes can round out the rest. Large shelters grab a lot of wind, and generally, are inappropriately matched to thin skewer stakes. A thick and durable stake bag allows the stakes to be stored with the shelter, and the stake bag packed with the shelter, thus protecting the shelter from being punctured by the stakes. When traveling with this type of floorless group shelter system, each group member should pack along a lightweight ground cloth or bivy sack for ground protection in the shelter. For our last Scout Leader trek, we took one two-man flat tarp and one four-man pyramid tarp, to give the leaders a little more experience with multiple shelters. 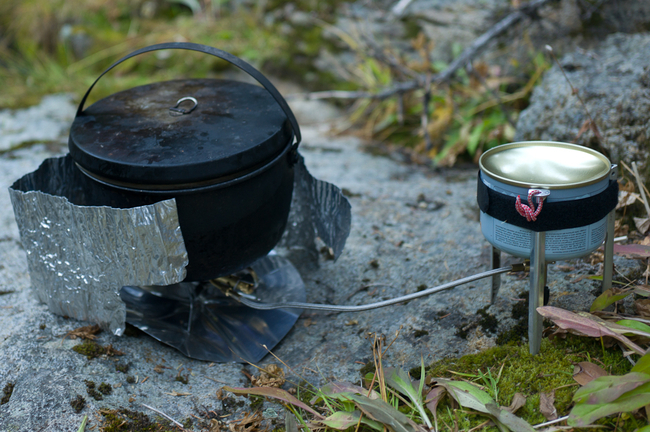 A simple, fast, light, and very effective group cooking system based on the Primus Express Spider and the Open Country Billy Pot. This setup, from a group traverse of the Teton Crest in September 2010. The Primus Express Spider is a compressed gas canister stove that can be used with an inverted canister, which extends its applicability to winter conditions by allowing for the fuel to be liquid-fed to the stove (thus eliminating canister cooling that degrades compressed gas stove performance in cold conditions). In addition, the Spider is light, durable, and has the large flame head required for rapidly boiling water in large pots. The windscreen is essential for conserving gas, especially in windy conditions. 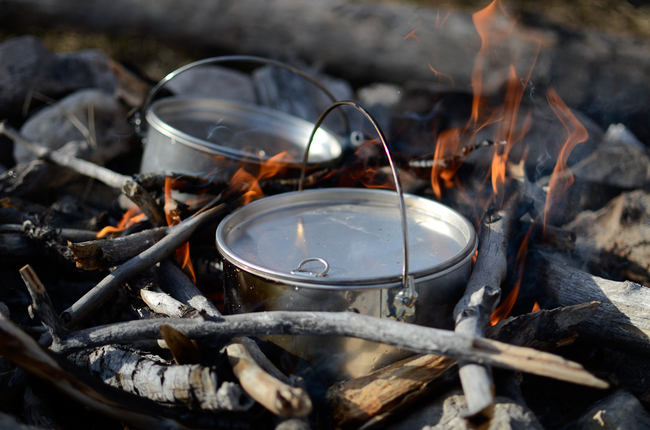 Open Country makes two types of pots – the 4 Qt Aluminum Kettle, and the 4 Quart Billy Pot. The Billy Pot is 3 oz lighter, has a nonstick coating on the inside, and more rounded edges that allow for slightly easier packing. Cooks use the MSR Alpine Folding Spoon to ration out dry foods into personal mess kits, which can be as simple as a bowl and spoon (mug optional). Generally, with this style of cooking (see Foods section below), you simply add hot water to dry food, and let it rehydrate in personal bowls. I recommend that each person carry a Glad Ziploc Bowl with a homemade “cozy” made from Reflectix that can be used to insulate the bowl after the water is added while it is “cooking” – a process that takes 5 to 10 minutes with most dry foods. Hand Sanitizer is kept in the cook kit to make it as easy as possible for cooks to maintain good hygiene. We use BAK instead of alcohol because in high mountain environments, dry skin results in cracking, especially on the hands, and alcohol stings! Our firestarting kits are stored in the 4×5 Loksak bag and include the firestarter (which is used to light the stove, too), firestarting tabs, and Esbit fuel tablets. I recommend saving the fuel tablets for emergencies only (e.g., when you absolutely have to get a fire going fast in wet conditions). All of the supplies will fit into the cook pot, which then goes into a cheap poly bag, such as the Backpacking Light size S Pack Liner, for storage inside somebody’s pack. I recommend the poly bag in case you cook over fire, thus protecting pack contents from soot. On the Scout Leader course in the Bob, we cooked quite a bit over fire, and only used the stoves here and there. Fire is more fun. Stoves are more useful in sensitive areas, or when you’re in a hurry. Two Open Country 4-Quart Kettles preparing dinner water for a crew of 12 in the Bob Marshall Wilderness. When all members of our group are carrying enough water bags or bottles for “a few to several” liters of capacity per person, then we usually don’t bring any big water bags like the Platypus 6L. But if we’re traveling through some place like the Beartooths or Wind Rivers, where water is plentiful and you only really need to carry a single 1L water bottle, a large group bag is nice for in-camp use. The trick to making Aqua Mira efficient for group travel is the pre-mix bottle. I use a Backpacking Light MiniDrop bottle for this purpose. In the morning, we add about 100 drops of Part A and 100 drops of Part B into the pre-mix bottle (e.g., enough pre-mix to treat 14 liters of water). Then, when it’s time to treat water, we dispense 14 drops of the premix into a 1 liter bottle of water that needs to be treated (28 drops into a 2L bottle, etc.). With large groups or on treks where we’re consuming a lot of water, we might have to make another bottle of pre-mix during the day. Like any group gear “kit” that contains small parts, I like to have a dedicated storage bag, which is well worth its minuscule weight for its ability to contribute to group gear organization. 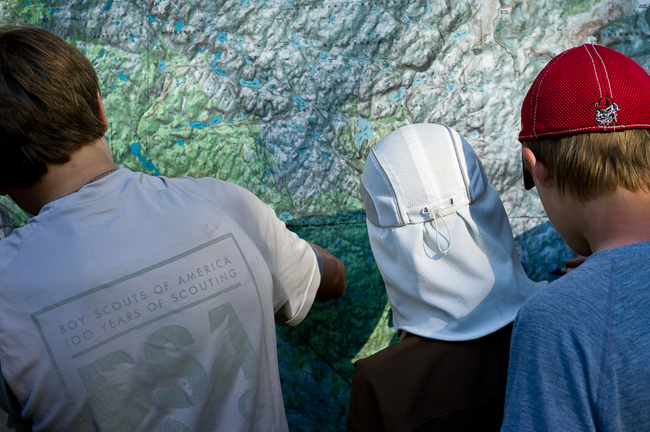 Troop 676 Boy Scouts get ready to 'hang' their bear bags over granite cliffs near Rough Lake in the Absaroka-Beartooth Wilderness, July 2010. If everyone brings their own food storage stuff sacks (and odor resistant plastic bags to line them with), then group bear bag hanging gear can be as simple as a big rope. I like to use Backpacking Light AirCore Pro Rope for group hanging because (a) it’s strong enough and (b) it’s nice and slick which makes it easy to pull over tree branches with a lot of weight. Food weights that are heavier than about 30 pounds are hard to pull, so consider having multiple ropes on trips where you have to hang more than 15-20 person-days worth of food. The rock sack is simply a little stuff sack that is big enough for a baseball-sized rock. Put the rock in the sack, tie the end of the rope to the sack, and sling it over a tree branch. This saves the pain of tying a slick rope around a round rock and watching the rock sail into oblivion while the rope falls into a lifeless clump at your feet because it fell off the rock. 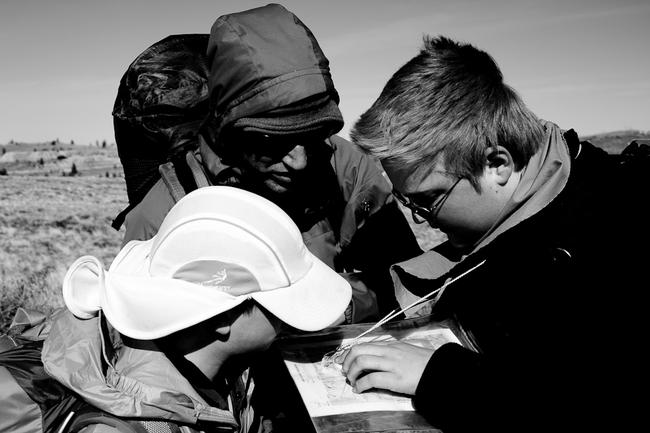 Navigating the old fashioned way - by map and compass - in the Tobacco Root Mountains, March 2010. The GPS and SPOT are optional devices. A GPS can save time, and a SPOT is a neat device for blogging your trip locations to your friends. With groups, I highly recommend a satellite phone. With a satellite phone, you have the flexibility to change exit logistics, get an emergency weather report, and as needed, deal with a life-threatening emergency fast. I like sharing the map and compass with the group. Navigation is an activity ideally suited for collaboration, and having everyone looking at one map connects group members. I’m interested in learning about your favorite group gear, and what you might consider for shelter, cook systems, water treatment, and more when you hike with your family, troop, or crew of pals. Please leave your feedback below!